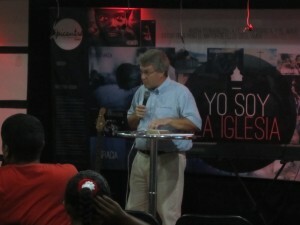 Epicentro Church in Panama is a church that has invited me to speak to them in the past. Building on those visits, they invited me to give another seminar on personal evangelism as well as preach for their evening service. For the first segment, they heard me share about how to maintain a passion for personal evangelism, in the face of many different fears that are natural. Only time will tell exactly what fruit this bore. The immediately observable result was a ministry time of renewed dedication to reach people for Christ. In 2013, Epicentro church will launch two new churches, one in the city of Panama, and the other in Santiago, the capital city of Chile. 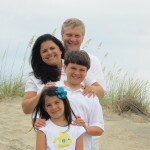 Several of their leaders from Chile joined in via an internet connection for the worship service where I felt led to teach on the DNA of a church. What do you want your church visitors to think when they experience your church? God is in your midst. 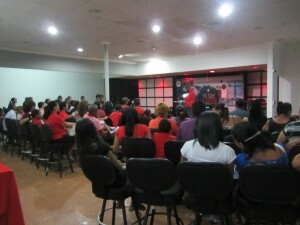 Epicentro church is a church in the Pentecostal stream. As they set the DNA of two more churches, thinking about visitors will become part of their DNA. 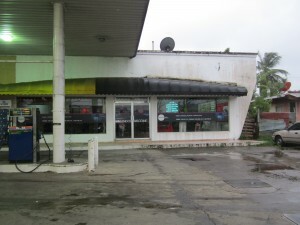 They are a little under 4 years old and currently meet in a former gas station convenience store they rent near a busy intersection and bus stop. Even though their resources appear meager, they have a heart to plant churches instead of hoard their resources for themselves. A special thank you to the donors who helped make this visit possible! Your gifts help set the DNA of 3 churches with the potential for more!